Üsküdar University Clinical Pharmacogenetics-Advanced Toxicology Analysis Laboratory is Turkey's first ISO 17025 accreditation document in toxicology. The accreditation proves that the results of a laboratory's work are no mistake that the reports are accurate. 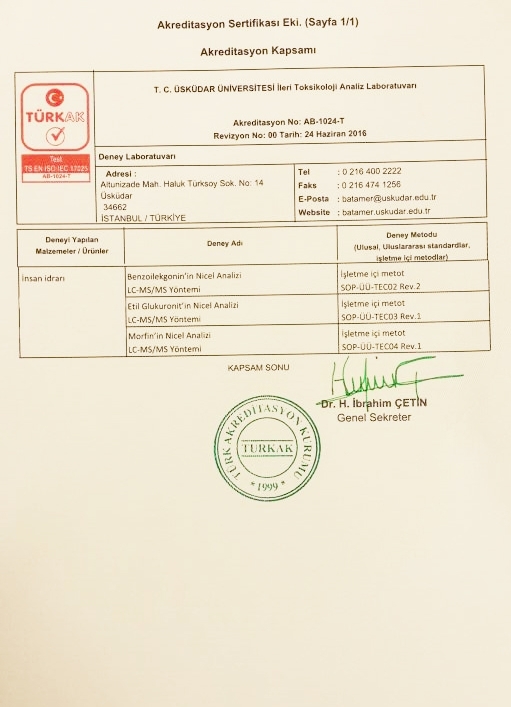 Üsküdar University Clinical Pharmacogenetics-Advanced Toxicology Analysis Laboratory, which successfully passed the documents and field inspections of the International Accreditation Association in September 2015, received ISO 17025 accreditation certificate. The validity and reliability of the measurements made in alcohol, cocaine and morphine analyzes in the field of toxicology are accepted in all ISO countries. About 60 items are being distilled! In Üsküdar University Clinical Pharmacogenetics-Advanced Toxicology Analysis Laboratory, the substance analysis can be made especially for cocaine from urine sample in 20 minutes. Nearly 60 substances in a sample can be distilled. We can also take samples from hospitals and AMATEMs. We have 6 toxicology panels. The first is alcohol, the second is amphetamine and its derivatives, the third is cocaine, the fourth is marijuana, the fifth is opium, i.e. heroin morphine and codeine, the sixth is a compound called bonsai among the common cannabinoids. We analyze these issues. Until today we have always analyzed from urine samples, and as a team we have experience, knowledge and technology that can also analyze hair. We have developed our methods and validation approaches compatible with the international rules, both the Food and Drug Administration (FDA) and the European Medicines Agency (EMA). So we are doing all the work to prove that the method is valid.